Well, the dirtier your fuel system is, the bigger the improvement you’ll see in performance and gas mileage. But it's critical not to wait until your engine is running poorly, you've wasted hundreds of dollars in gas or maybe even damaged your fuel injectors and catalytic converter. Look, gasoline is a petroleum-based product and will leave some residue, gum and varnish along the way. Some of that can find its way into your fuel injectors and interfere with their vital job. The fuel injectors do just that – inject fuel into your family car engine. They spray a precise amount of fuel, at a precise time, in a precise pattern, at a precise pressure. When they are dirty this vital precision just isn't possible. So your family car engine can run rough. 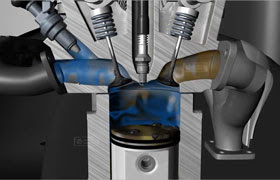 Also carbon deposits build up on valves and in the combustion chamber. Fuel economy suffers and performance is degraded. These dangerous conditions allow excess unburned fuel to pass out through the exhaust to accumulate in the catalytic converter – which can lead to it overheating and failing for Minneapolis auto owners. So bad gas mileage, poor engine performance and the chance of having to replace pricey fuel injectors and catalytic converters – all potential problems for Minneapolis car owners with dirty family car fuel systems. A professional fuel system cleaning cleans out deposits, fuel injectors and the air induction system. Minneapolis drivers get optimal power, performance and gas mileage and it helps avoid pricey future repairs. Now I said professional fuel system cleaning: this isn't just pouring a bottle in the gas tank. Cleaner is added into the fuel system with a special tool attached to a vacuum source and there is some manual scrubbing of the throttle body and air induction system. If you are experiencing a rough idle or unusually poor fuel economy, ask your cheerful Mr Tire Service service professional if a professional fuel system cleaning at Mr Tire Service in Minneapolis is in order.